And what? What is this going to accomplish? Us turning into future George Zimmermans, shooting “preemptively” at each and every perceived threat? Great. That’s how Islamophobia got out of hand in the first place. That’s how yesterday happened. My buying a gun isn’t going to solve anything. Gun control isn’t going to solve anything, either. We can make it a little harder to purchase guns, but people who want to kill others for whatever reason will get it accomplished by means legal or illegal. A mentality cannot be policed. Parts of the solution are in a) the government, media and all of us treating white supremacist hate groups exactly the same as Islamist terrorists, b) increased support for mental health and c) education, but it doesn’t get us the whole way there. D says there will always be crazy people and we all die somehow, so the answer is to live your life well and hope for the best. I refuse to accept this as is, however. For chrissake, we just put another rover on Mars and we’re supposed to be reaching for the stars instead of a person of Indian descent looking at a black person as a potential mugger, that black person considering the Indian an Arab terrorist and some white person lumping all of us in a big non-white pot and looking at us like a festering collective of crap. It’s 2012. I expected more from us by now. And that includes more funding for NASA. 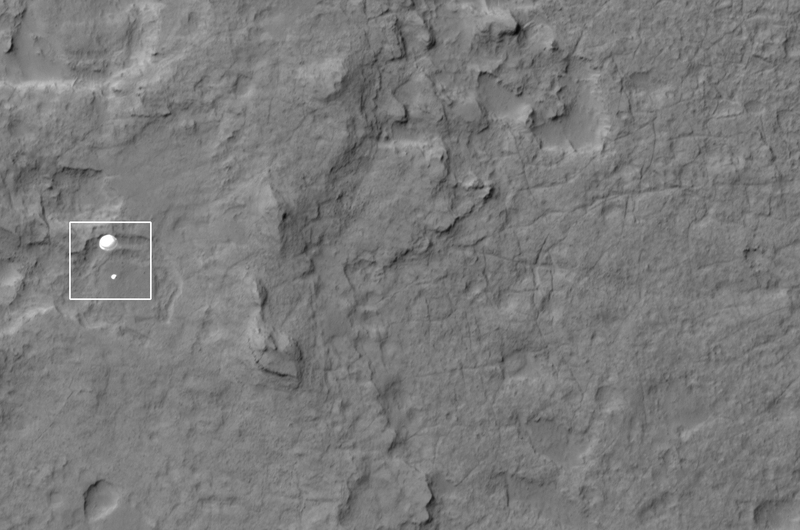 This is a picture of the Curiosity Rover landing on Mars as captured by the NASA’s Mars Reconnaissance Orbiter. Is that an orthogonal, vertical joint set to the right? Keep looking. It’s all we can do. What is not changing: The long list of problems that follow the statements above. We must somehow reprogram ourselves to welcome the different, the unfamiliar, instead of bristling at it and going into defensive crouches. Yes, that means that many of us will have to change our very natures — but that is evolution at work, and it must continue if we are to survive as a species.